Never travelling to the US without it. Best to get it but wish didn't need to travel via HK for pick up. 5 stars. Stay connected to your friends, family, and social networks anywhere you go in the USA! This US SIM card from Ultra is capable of providing you with unlimited data streams thanks to the high-speed 4G LTE for the first 4GB, and unlimited 3G service thereafter, making sure that you have an internet connection anytime, anywhere. You'll be able to share your trip with everyone. You'll also receive unlimited calling and texting capabilities within the United States, and unlimited international calls to 55 countries (the first 1000 minutes are free for 15 countries!). 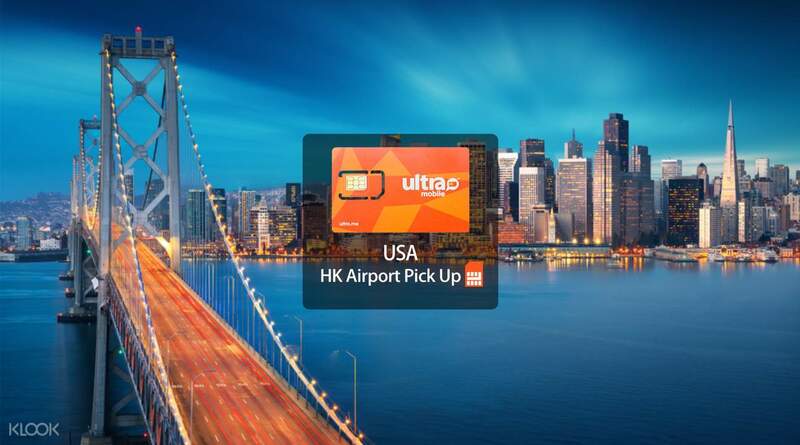 As soon as you book your ticket, simply pick up your SIM at Hong Kong International Airport, and you're all set. My second time to use this. Network quality was fine in large city areas but very limited connection in rural area. My second time to use this. Network quality was fine in large city areas but very limited connection in rural area. easy to use with detail instructions on the packing. pls start the sim card only after you land in USA. smooth reception in San Francisco. easy to use with detail instructions on the packing. pls start the sim card only after you land in USA. smooth reception in San Francisco. When I travel to US, I usually buy the local SIM card. It was always more expensive than this SIM card. I found this SIM is much easier for me to travel to US. The Wifi and the calls are very stable. It was much better the T-Mobile or AT&T. I would highly reoommend this SIM card and this last 30 days. When I travel to US, I usually buy the local SIM card. It was always more expensive than this SIM card. I found this SIM is much easier for me to travel to US. The Wifi and the calls are very stable. It was much better the T-Mobile or AT&T. I would highly reoommend this SIM card and this last 30 days. The SIM Card for US 30 Days period is very user friendly and readily applied upon landing in US soil. It can save travelers lot of panic experiences for catching Airport Free WiFi at destination countries as it is always new for us and uncertainty also prevails in new environments. USA is particularly important because of the opposite time zones with home base that it is quite unlikely asking for clarification at the time when connectivity is in question. The SIM Card for US 30 Days period is very user friendly and readily applied upon landing in US soil. It can save travelers lot of panic experiences for catching Airport Free WiFi at destination countries as it is always new for us and uncertainty also prevails in new environments. USA is particularly important because of the opposite time zones with home base that it is quite unlikely asking for clarification at the time when connectivity is in question. It was a bit confusing for the activation part. I did first the website, then text and phone call. The reason because it wasn’t an instant activation. It took like 10-15mins in order for the data start working. But after that, it was fine. I think if Klook can upload a simple video of of activation instruction would be nice. It was a bit confusing for the activation part. I did first the website, then text and phone call. The reason because it wasn’t an instant activation. It took like 10-15mins in order for the data start working. But after that, it was fine. I think if Klook can upload a simple video of of activation instruction would be nice. It was easy to pick up at the Hong Kong airport. I used the SIM card upon arrival. The connectivity was good and plenty of data to use for 7 days in the United States. It was easy to pick up at the Hong Kong airport. I used the SIM card upon arrival. The connectivity was good and plenty of data to use for 7 days in the United States. Never travelling to the US without it. Best to get it but wish didn't need to travel via HK for pick up. 5 stars. Never travelling to the US without it. Best to get it but wish didn't need to travel via HK for pick up. 5 stars.